“40% of the air that we breathe in our homes comes up from the basement.” Yes, everyone in the house is breathing air that was once in the basement…that’s not good air! A recent study indicated that foundation walls, due to their porous nature absorb 10-15 gallons of water vapor (or humidity) per day, which is responsible for up to 80% of the home’s indoor moisture, and can accelerate the growth of bacteria, mold and mildew as well as create allergies/asthma, attract bugs, spiders and pests. Unfinished and finished basements both create risks for toxic exposure throughout the whole home. In an effort to make your home less toxic, it is important to control water leaks and water entry, from the basement into the rest of the house. Additionally, controlling mold is important as this toxin, more than any other, will place your family at greatest risk. The humidity and condensation in the basement is what most often creates a mold risk. 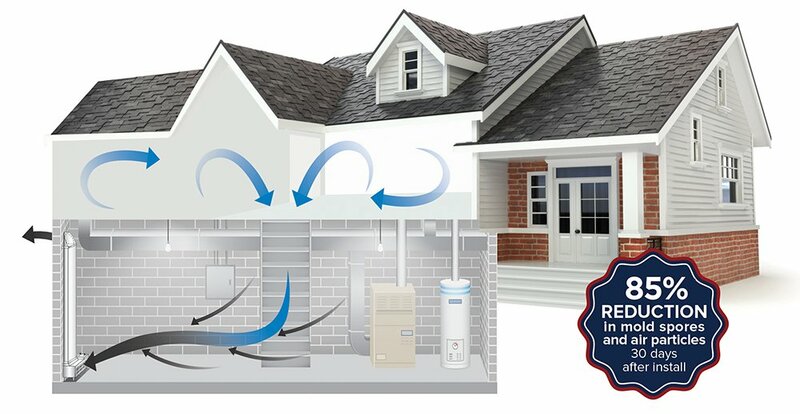 EZ Breathe placed in the basement of the home addresses these moisture issues in the basement by exhausting the water vapor at its source thereby reducing the chance for bacteria, mold, mildew growth and the whole host of adverse health risks associated with dirty basement air. With humidity and condensation left to run amok, the basement of your home can create a health risk to the entire house. Because basements are generally cooler than other parts of the home, it is important to insulate the pipes and walls correctly and to ventilate the space by bringing fresh drier air into that space. Keeping the basement warm and dry in the winter months is critical to reducing the development of toxins in the home.